10 Commercial Real Estate & Properties in Yeppoon are listed in 5 categories. We have 3 Hotels and LeisureSale , 3 Industrial Warehouses Sale , 2 Retail ShopsSale , 1 Development LandsSale and 1 OfficesSale . Commercial Beachfront Space For Sale Or Lease.. Offers over $655,000 + GS.. 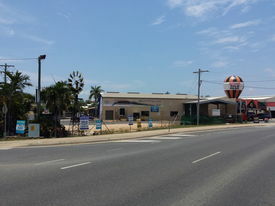 Offered for Sale or Lease, this prime location is at the top of Yeppoon's main street with maximum exposure, beachfront views, and is a manageable size of freehold 161 square metre site. Ideally, this would suit a professional practice or franchise operation wanting to own their own premises. There is opportunity to rent the space, try before you buy, and then become the owner occupier. Previous operators have achieved good weekly earnings, although the site has endless opportunity to be referred into retail space, office, professional practice or can even be converted into a beachfront unit. Property includes: Commercial fitted out kitchen bar, with functional design Indoor/outside seating for 100 7 days trading if desired Body Corp applies Fantastic Location with excellent exposure With sea and island views at your door step and with Yeppoon now seen as the gateway to QLD's offshore island playground this is an investment well worth an inspection. Listing freehold price $655,000 + GST NEG, Rental terms negotiable. Lifestyle Living - Imagine Waking Up To This.. Expressions of Interest. For Sale by Expressions of Interest. Habitat is a truly unique property for sale. Where else can you find 32 acres of land with three hundred and sixty degree views including uninterrupted, pristine ocean and island views so close to a coastal town centre? This private and secluded lifestyle block is ideal to build a spectacular dream home to cater for a family of any size. Or, alternatively, the property is approved for subdivision to develop an exclusively private community with just a handful of neighbours. Views from the various ridges and peaks are nothing short of jaw dropping. Crystal clear days, azure blue waters of the Pacific Ocean, dotted by emerald green Islands forming part of the Great Barrier Reef, this is paradise at it's finest. Imagine designing your ultimate dream home, utilizing natural surrounds as your inspiration to design something truly spectacular and unique. Decks could surround every level to take in Sunrise and Sunsets daily, elevated, natural cool breezes, natural, established vegetation, rural and ocean views, this fairy tale position has it all There will always be a market for properties with ocean views and Yeppoon offers a seachange lifestyle with established infrastructure in place, offering a lifestyle of live, work and play, that few other Queensland coastal towns can offer. Yeppoon's town area offers a relaxed village feel yet is abuzz with recent construction of foreshore redevelopment on the Main Beach as well as newly established Apartment Commercial complexes attracting national dining and retail franchises. Yeppoon is just 38km from Rockhampton and 42minutes from Rockhampton's Domestic Airport, on the Tropic of Capricorn boasting moderate to warm temperatures all year round. Now is your opportunity to secure a truly spectacular and unique parcel of land in an idyllic location, yours to enjoy alone, or develop and share, the choice is yours. 13.13 hectares or 32 acres of pristine ocean views Overlooking the beautiful Yeppoon Coast and Keppel Bay Marina Large Lifestyle Lot Fully approved for subdivision Click on Video Tour for further information. Presentation Plus Situated in the heart of Yeppoon with ocean views and overlooking the main street. Very spacious 450m2 (approx) layout (presently used as Doctor's Surgery) with first class presentation comprising four bedrooms, main with walk in robe and ensuite, large open plan tiled living, high ceilings, quality kitchen with Caesar Stone benchtops and Miele appliances, plantation shutters throughout, fully air conditioned, separate laundry and more. This property would suit a variety of businesses e.g. office complex, entertainment venue, medical practice etc (subject to Council approval) being in the centre of the retail and commercial section of the CBD. The sheer size of the suite at 450m2 is a very rare offering in this prestige location. Internal inspection recommended. This large 1500m2 industrial shed has excellent height, air conditioned offices of approx 140m2 plus 1.1 hectares of low impact industrial land situated in a handy Yeppoon location just minutes to the CBD. There is a new 7 year lease to an engineering firm. Tenant pays all outgoings and fixed increases of 3% per annum. Rental $162,240 per annum. A rare opportunity to secure a quality investment showing a high 9.8% net yield. Phone today for an inspection. Situated on a 4826 square metre allotment this complex comprises of approx 1350m2 under roof and divided into 4 sheds ranging in sizes from 179m2 to 514m2 with offices, amenities and ample hardstand concrete The allotment has a frontage of 97 metres and has exposure to the Rockhampton Yeppoon road. The Capricorn Coast and Central Queensland has strong growth and loads of potential from the developing LNG and coal mines developing in Central and Western Queensland. This property is also available for Lease by negotiation. Phone to inspect today.